Since 1991 the city of Muenden is officially called "Hann.Muenden". The "Hann." stands for "Hannoversch" (till 1866 Muenden was part of the kingdom Hannover) and was added to the name to avoid confusing Muenden with the Prussian city of Minden. 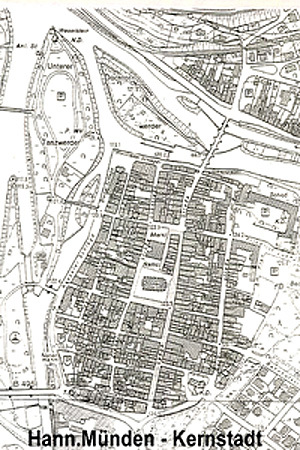 The more or less rectangular street layout in Muenden indicates that it was a planned city. It is still not known for sure who did the planning. It could have been Henry the Lion (Heinrich der Löwe), but there is also some evidence that Thuringian landgraves were responsible. A document from 1183 indicates that Muenden had its own pastor. Muenden must therefore have had its own church and city rights at that time. This proves that Muenden is one of the oldest cities in Lower Saxony. Because of its location at the confluence of the Werra and Fulda rivers Muenden was destined to become an important center of commerce. The prosperity of the city and its business people, shipping brokers and craft and trade people from the past centuries is reflected in the magnificent Weser Renaissance city hall (Rathaus) and the many well preserved half timbered houses. Am Kirchplatz 4, for example, is the oldest "Küsterhaus"(house no. 561) in Lower Saxony. Built in 1457, the house has well preserved carved wood reliefs on the deep jetties. During the 30 Years War the royal commander Johann Tserclaes Landgrave of Tilly besieged the city and overran it after an intensive bombardment on Pentecost Monday in 1626. Witnesses reported of brutal scenes of large scale murder and plundering, but the houses at least survived the massacre. Tilly established his headquarters in a house on Marktstraße which was built in 1580 and still has to this day the same basic appearance. The face of the city remained practically unchanged even during the occupation by French troops during the Seven Years War as well as during the 2nd World War. Minimal damage was incurred during the war in an attack on Black Friday 1945 in which bombs fell on houses Am Plan, in Wilhelmstraße and in Böttcherstraße. Occasionally in the history fires have destroyed houses usually several at a time because of their close proximity to each other. Some industrial complexes from the 19th century such as the Wentzler leather factory on Siebenturmstraße were removed; but the character of the half timbered city could not only be preserved but improved by restoration work. A good example of a successful restoration project is the house Rosenstraße 18, which like many houses suffered damages due to the application of a coat of plaster in the second half of the 19th century.